I received an advanced reader’s copy of this book through Goodreads First Reads. The following review may contain slight spoilers. 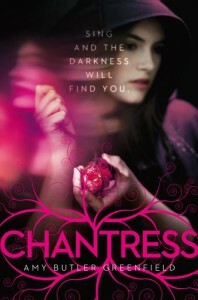 Chantress by Amy Butler Greenfield is an intriguing tale about a girl whose spell-singing powers lend her the special strength to be the saving grace for the people of England, while also putting her in grave danger. The protagonist and narrator, Lucy, is a likeable and realistic character, and as a result, it is interesting to see her interactions with the other characters as well as her progression throughout the story. For her first teen novel, the author has done a good job in creating a plot with unique elements in a well-developed setting. The storyline is straightforward with minimum twists, which might frustrate readers who are looking for more than a casual read. The main antagonist and his underlings also do not make enough of an appearance to give him a truly villainous presence throughout the book – at times it felt more that the story was simply about Lucy developing her powers, with the defeat of the villain being only a final display of all that she has learned. One of the more refreshing things about this book is that the pace, while somewhat slow, allows for a more realistic development of an aspect that is often overly emphasized or rushed in books like these – the romance. Lucy and her love interest develop their relationship in a believable way, leaving plenty of room for growth in future books. Overall, the book does not disappoint. What it lacks in terms of a complicated plot is made up by a solid main character and good narration. While I may not be waiting on the edge of my seat for a sequel, I do look forward to the continuation of Lucy’s adventures.